An Exemplary Exercise for Building Goal-Keeping Kids (includes Downloadable Document) - Dave Stuart Jr. In “The Kind of Science that Teaching Needs,” I shared an “experiment” I whipped up last year to help my students set and stay committed to their goals. If you read that article, you'll know that I have to put “experiment” in quotation marks because it was missing a few important pieces of experimentation (like, you know, a measurement method or a hypothesis). However, if you watched the video that accompanied the experiment, you know that a lot of my students were struggling to carry out their goals from week to week (the video is here in case you missed it). Thankfully, that article prompted reader, Stuart cousin (! 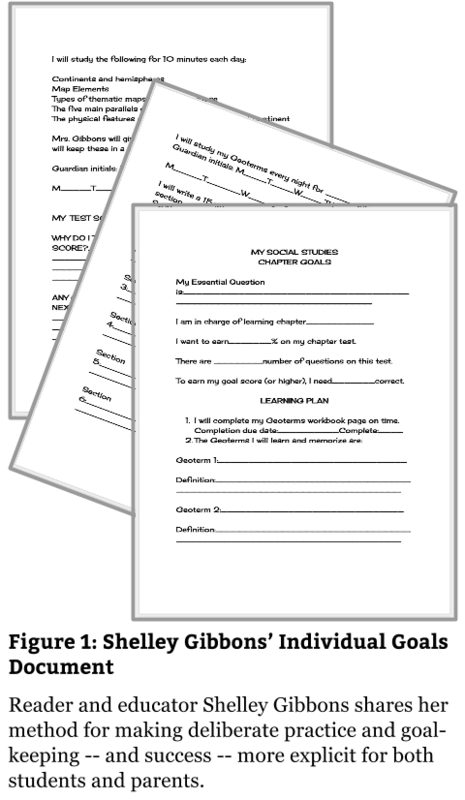 ), and educator Shelley Gibbons to write me with a goal-setting exercise (see Fig. 1; free download instructions below that) that she has found works well with students. I'll let her take it away from here, and then I'll suggest a few ways that this document could be tweaked to fit a variety of contexts. I just read your article on the science of teaching, and thought I would pass this goals document I created last year along to you. I noticed from your video that a number of your students were having difficulty following through on their goals. I've found that sixth graders and ninth graders need to team up with their parents to achieve success, because entering a new school is such a transitional time. Both my students and parents liked the concrete format of this learning goals document. It helped parents to know what their children needed to study, and it laid the learning process out for the students in do-able increments. My class average on tests went up 10%. You'll notice that I also have a reflection piece at the end of this form. My students received completion grades of a few points for having their parent's initials on the form, and they knew I would be checking these. This further helped with accountability on their part. I'm not sure what social studies curriculum you use. I use Geography Alive! from TCI, so this form is geared specifically to that program. Please feel free to make a copy and change the format of this document to go along with your curriculum if you choose to use it. A Note on Google Docs Sharing: If you choose the Google Docs version, you need to File > Make a Copy if you want to edit it. Also, sometimes folks' school districts have weird settings on Google Apps, so you may not be able to access it at school. Finally, if for any reason the Google Docs version isn't working for you, please know that I can't respond to “Share” requests through Google Docs. My articles of the week page already produces dozens of Share requests per day, and I don't try keeping up with them anymore — mainly because all of my docs are set to “Anyone with the link can view,” which means you can access and File > Make a Copy of any of them that you'd like. If you can, measure this document's effect on student performance this year. Notice that Shelley was able to demonstrate a 10 percent increase in test scores. That's significant. The tool is useful for building the school-parent partnership. Shelley explains the goal-setting routine to parents at the start of the year, and parents know to look for the sheet at the start of each chapter. Not all of your students' parents may use the document, but remember: we're not looking for silver bullets, just swords for combatting the dragon of school-home disconnect. Shelley's document merited sharing because of how well it's suited to her setting and because of the ways it gets my mind running. How can I make success more explicit for my students this school year? I suspect that doing this will result in more students owning their learning, thereby leading to more long-term flourishing. Thank you to Shelley Gibbons for letting me share this with the community of educators who come to this blog for help and encouragement. All the best to you, your family, and your students this school year, Shelley!